Considering competitive strength, financial performance, and cash distributions, Home Depot looks well-positioned for attractive returns going forward. 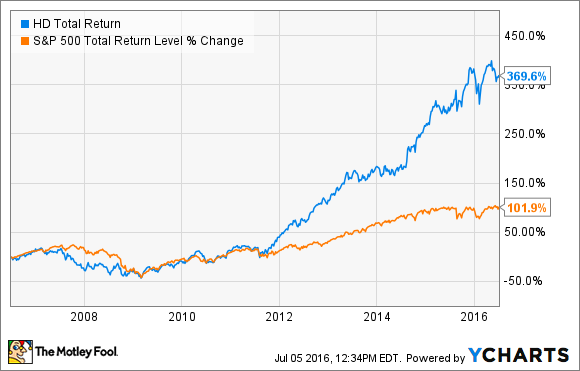 Home Depot (NYSE:HD) has delivered spectacular returns for investors over the long term. The stock has gained nearly 370% on a total return basis in the past decade, meaning dividends plus price appreciation, downright crushing the S&P 500 index and its total return of 102% over the same period. Even better, when considering competitive strength, financial performance, and cash distributions, it looks like the company still has a lot to offer going forward. It all begins with business quality and competitive strength. Home Depot is the largest home-improvement retailer in the world, with nearly 2,300 stores throughout the United States, Canada, and Mexico, and the business is expected to generate $94.3 billion in revenue during the fiscal year ending in January 2017, an increase of 6.5% versus $88.52 billion in the prior year..
As you can see in the chart below, Home Depot has been growing its revenue over the past decade, handily topping the growth seen at No. 2 home-improvement retailer Lowe's (NYSE:LOW), which has approximately 1,860 stores in the United States, Canada, and Mexico and is expected to produce $63.4 billion in sales this fiscal year. Home Depot and Lowe's are the two leading players in home-improvement by a wide margin, and this provides crucial advantages in the business. Most products in the segment are relatively expensive, and they can have a big impact on budgets, so consumers tend to pay a lot of attention to prices. Massive scale allows Home Depot to negotiate low prices with suppliers. The company also spreads its fixed costs across a huge numbers of products, which reduces fixed costs per unit. In addition, scale and product diversity generate attractive opportunities for cross-selling. A bigger business is a stronger company in home improvement and Home Depot comes second to none in the industry, and this sets the company apart from smaller players trying to make inroads in the business. Retailers in different categories are being hurt by competition from e-commerce players, but home-improvement is one of the best-insulated segments around. The products are generally big and heavy, which makes cost-effective shipping quite challenging. Nearly 40% of online orders at Home Depot are picked up at the stores as opposed to shipped to customers, and this is a major advantage versus pure online operators such as Amazon. Besides, Home Depot operates in a specialized product category, and many customers rely on the specific advice they can get from knowledgeable employees at the stores. This allows Home Depot to build another source of competitive strength by offering a differentiated service. Home Depot's financial performance doesn't leave much to be desired. Total sales during the first quarter of 2016 amounted to $22.8 billion, a 9% year-over-year increase. 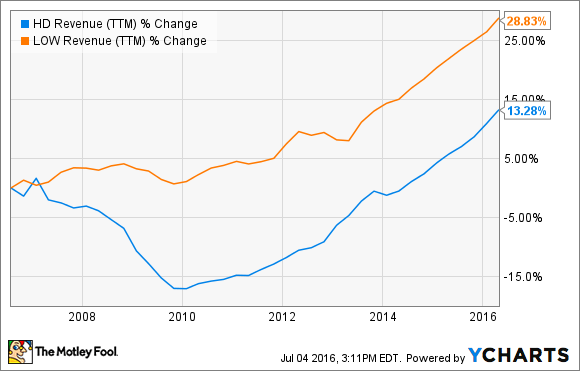 Total comparable-store sales increased 6.5%, while comparable sales in the U.S. jumped 7.4% . Home Depot made nearly $4 billion in online sales last year, this represents approximately 4.4% of total revenue. The number doesn't sound too impressive, however, online sales grew by a vigorous 21.5% last quarter, so the online segment is becoming an important growth driver for the buisness. The company is rolling out a new customer order management system to improve the online shopping experience, and management expects the full deployment to be complete in the U.S. before year's end. Home Depot is also expanding its Buy Online Deliver From Store -- BODFS -- service, and demand has been stronger than expected in markets where the platform has already been introduced. By comparison, Lowe's produced $15.2 billion in revenue during the first quarter, an annual increase of 7.8%. The fact that the two home-improvement retailers are delivering solid revenue growth shows that demand is quite healthy in the sector, and Home Depot continues outgrowing Lowe's, judging by the last financial reports from both companies. Home Depot is also running a tight ship and keeping costs under control, which is producing expanding profit margin. Operating profit margin was at 13.5% of sales last quarter, an increase of 109 basis points from the first quarter in 2015. Strong revenue growth in combination with increasing margins allowed Home Depot to increase earnings per share by 19% year over year. This is nothing short of impressive coming from such a big player in the retail industry. Home Depot has a remarkable track record of rewarding investors with growing dividends and buybacks over the long term. The company even sustained its dividends during the Great Recession in 2008 and 2009. Those times were as hard as it gets for companies related to the housing sector, so the fact that Home Depot was able to continue distributing cash to shareholders during the crisis speaks volumes about its financial strength. Dividends have increased at an impressive speed over the last several years. What was a quarterly payment of $0.225 per share in 2009 has now risen to $0.69 quarterly per share. In February 2016, Home Depot announced a strong dividend hike of 17% for the current fiscal year. Since the stock price has risen substantially over the last several years, the dividend yield is not particularly high in comparison with other dividend stocks in the retail sector. Home Depot is paying a dividend yield of around 2.1% at current prices. Nevertheless, the company is still a top-notch choice for investors looking for companies with superior dividend growth. Management is committed to increasing dividends every year while aiming to keep the dividend payout ratio at a conservatively low 50% of earnings over the long term. Home Depot also allocates considerable financial resources to stock buybacks, and the company has reduced the share count by a staggering 40% in the last decade. 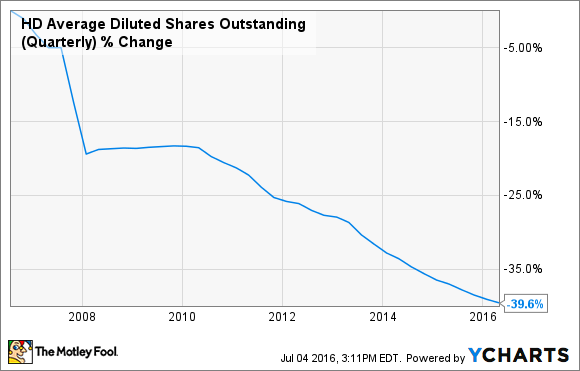 HD Average Diluted Shares Outstanding (Quarterly) data by YCharts. Buybacks can be an effective and tax-efficient way to distribute cash to investors. All else the same, the lower the share count, the more valuable those shares become. If the company is making the same amount of total earnings, reducing the share count increases earnings per share, so each share becomes more valuable thanks to buybacks. Importantly, shares of Home Depot have appreciated substantially over the last several years, so management has done the right thing by investing the company's money in its own stock. To wrap up, Home Depot enjoys unquestionable competitive strength in home improvement, and the business produces consistently growing sales and earnings, which the company distributes to investors via generous dividends and buybacks. As long as this continues being the case, chances are that Home Depot stock will keep delivering impressive gains in the years ahead.